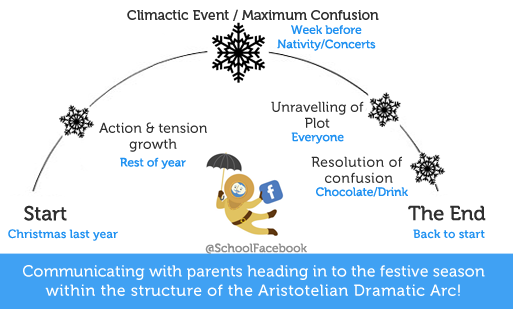 Communicating with parents heading in to the festive season within the structure of the Aristotelian Dramatic Arc! The story arc of your school should ideally be less Aristotelian and more ‘Downton-ian’ where the peaks and troughs are relatively gentle and you could be forgiven for thinking that nothing much is really going on! When school is on the front foot & leading communication it helps to make responding to parents less of a drama. We think Facebook is a key factor in taking the lead towards reclaiming school’s position as the authoritative news source. Previous PostPrevious Death Knell of the School Newsletter?